Happy 2015! 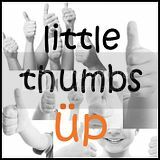 I've been waiting patiently for the arrival of January's Little Thumbs Up event! Why? Because the event's theme is noodles or pasta. There are so many possibilities, so I choose to go slow. Hahaha! 1. Prepare beehoon and all ingredients as mentioned in the ingredients list. 2. Heat up oil in a frying pan over medium-high heat. Add garlic and stir fry until fragrant but not burnt. Add chicken breast and cook until they turn slightly white. 3. Add carrot, cauliflower, mushroom, and sawi. Stir fry until all are cooked, maybe about 7-8 minutes. Keep on stirring to avoid burning. 4. Add the egg and mix until it turns fluffy. Add beehoon and stir to combine with all ingredients. 5. Add soy sauce and pepper to taste. Serve hot. Hi Joyce , thank you for linking with us ! 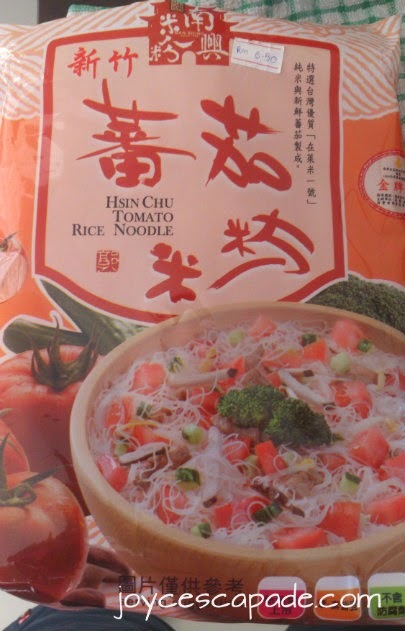 Bee hon is one of my fave noodles but haven't had that tomato flavor rice noodle yet :D Your delicious dish looks almost like the Singaporean-style curry noodles ! Me too love this type of fried bee hoon. 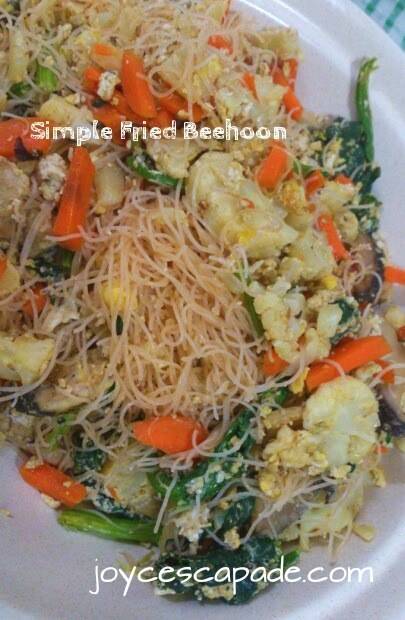 We had fried bee hoon tooyesterday :D Yours looks very inviting. Have not seen this type of tomato rice noddles here before. Will try it if I happen to see it in the supermarket. Yummy! Delicious! Whenever I see fried bee hoon, I always think of some curry gravy to go with it. This tomato bee hoon is interesting... and only home cooked bee hoon like yours can allow us to use this kind of interesting ingredients. Yum!